Introducing an iconic elegance that will make any girl feel like a fabulously encrusted jewel. 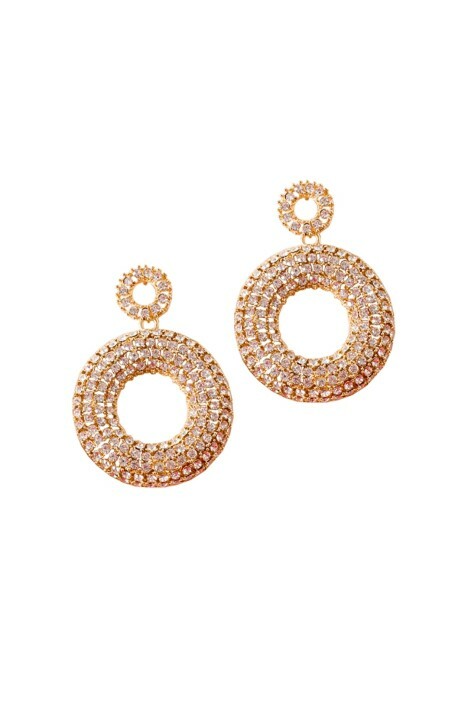 These divine drop earrings features 2-tier ring construction with an open back. With perfectly placed diamantes framed at the front, it makes for an eclectic collectors piece to rent for a ball event or as a statement piece, or for a theatre escapade in a bell sleeve number. For a finished glamorous look, style a velvety peach lippy and hire a off-shoulder dress to make be statement-defined. Our blog post on ‘What to Wear to the Theatre’ provides endless matching possibilities, so get your glam on!